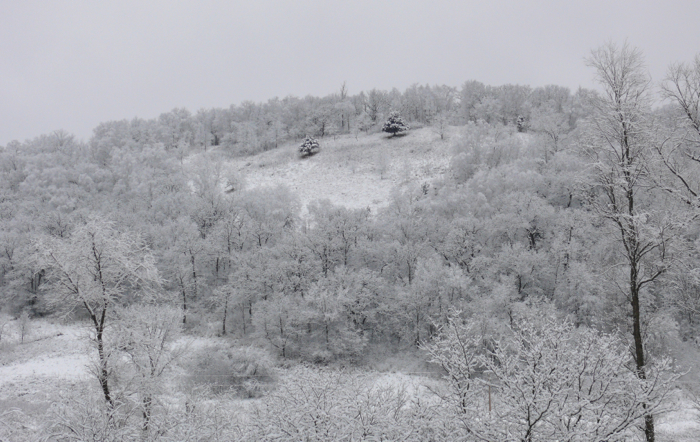 1/2/2011 – the start of a new year. 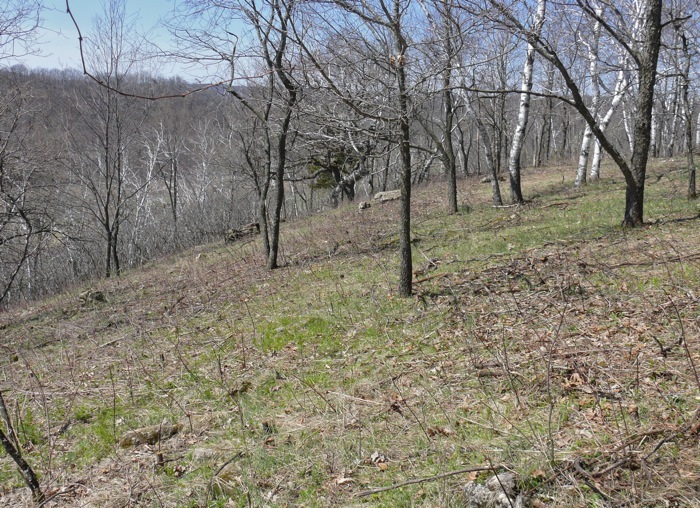 This is one of the areas where Mike and I cleared brush last spring. 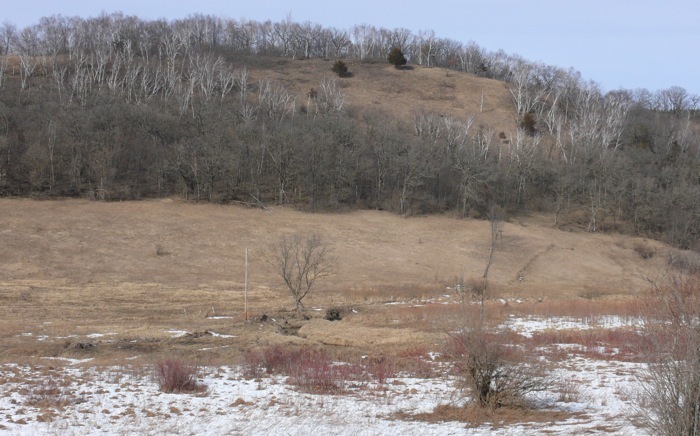 2/14/2011 – Sumac Prairie with melting snow cover. 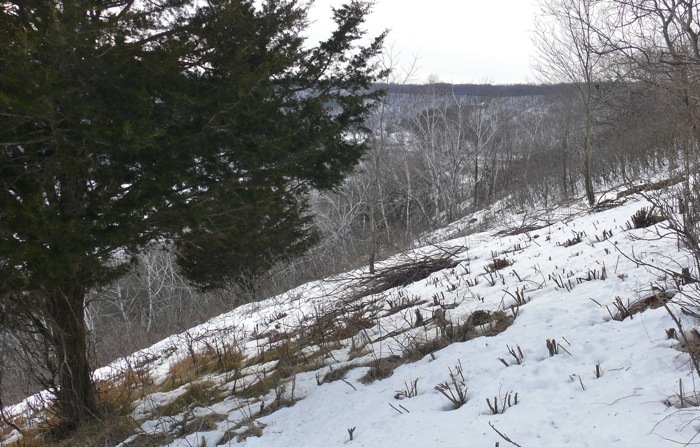 Because Sumac Prairie is such a steep south-facing slope, it’s one of the first places where the snow melts in warm weather. Then it snows again, melts again, and gets snowed on again. 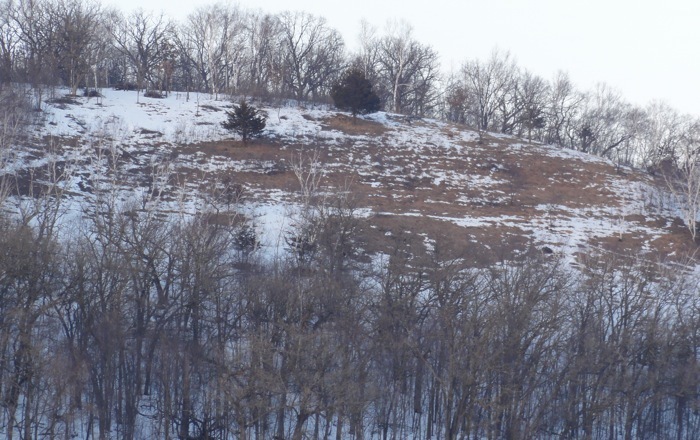 I wonder if these harsh conditions – alternating heat, cold, wet, dry – play a part keeping this hillside a prairie. 3/15/2011 One month later. 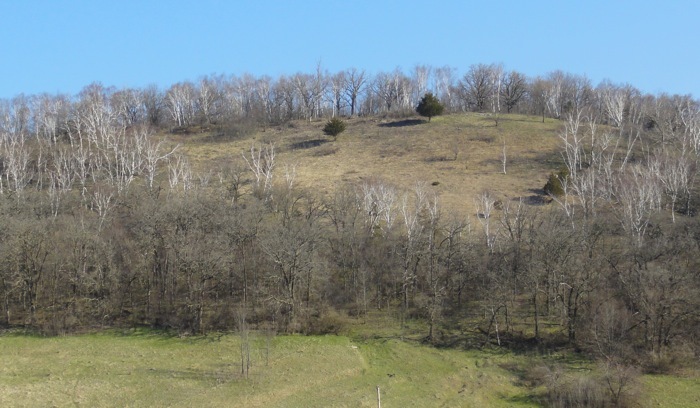 There were several more snowstorms and melts during that month, but now it’s looking like spring is really coming. 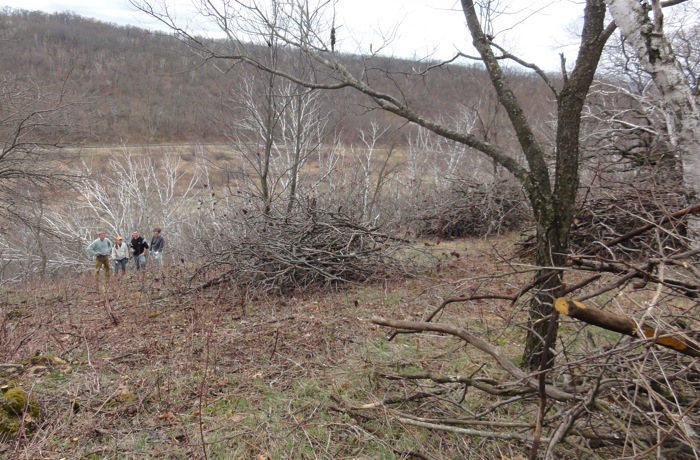 3/16/2011 – I started working on clearing brush again. 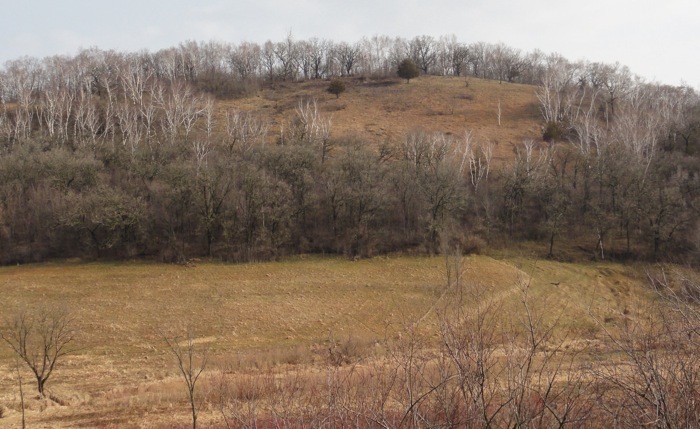 This is the top of the eastern side – east of where The Prairie Enthusiasts worked. 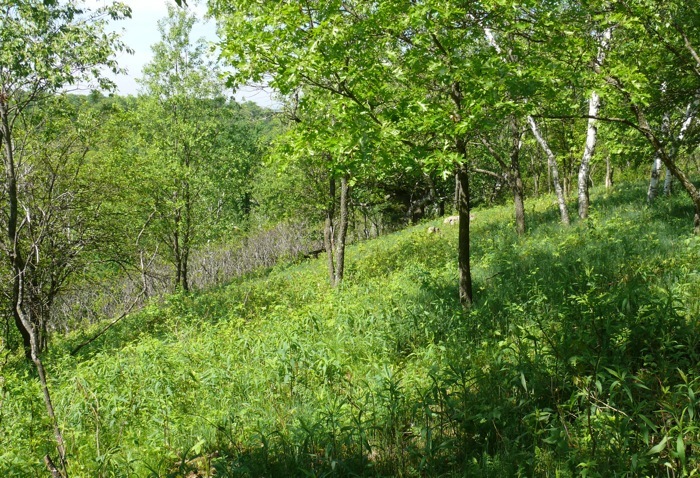 It was a thicket of prickly ash and honeysuckle. 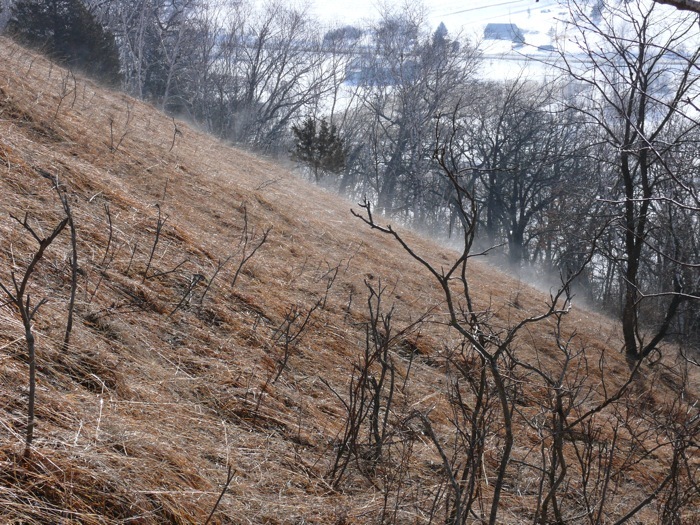 3/16/2011 – early morning mist rising from the sunny center of the prairie. 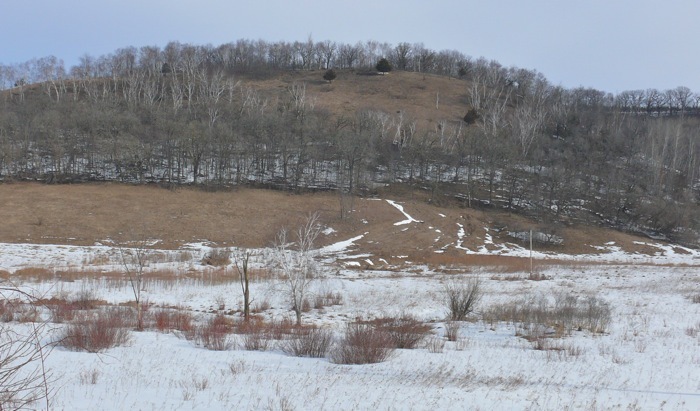 There’s still snow everywhere except on the bluff prairies. 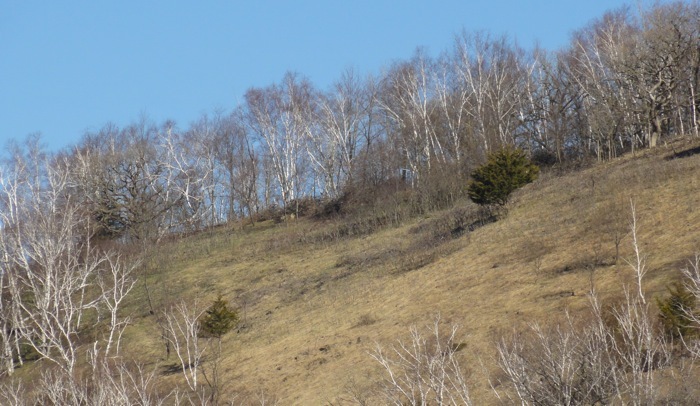 4/4/2011 Now there’s a faint haze of green on the hillside. 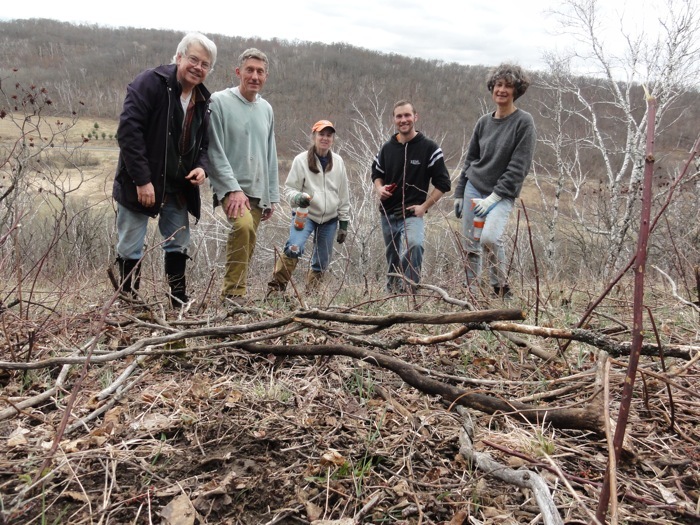 4/23/2011 The Prairie Enthusiasts came for another work day. 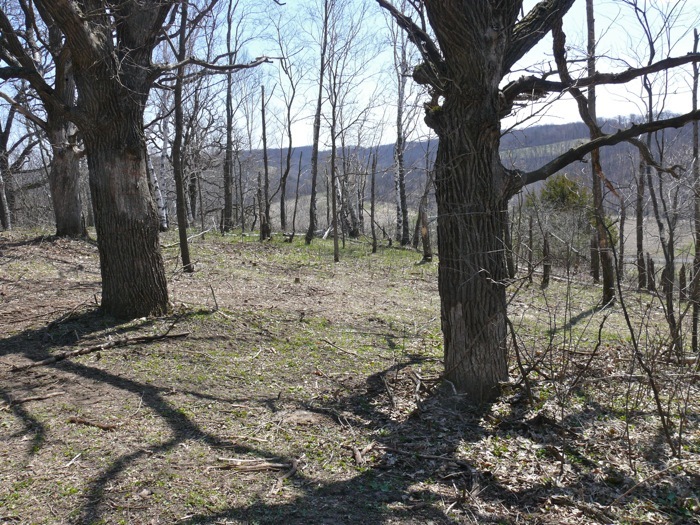 4/23/2011 Here’s the view of the area we worked on, seen from the road. 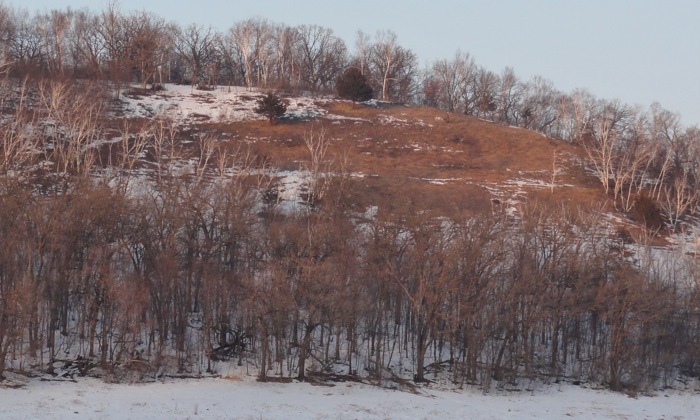 Those are our brush piles at the top on the left. 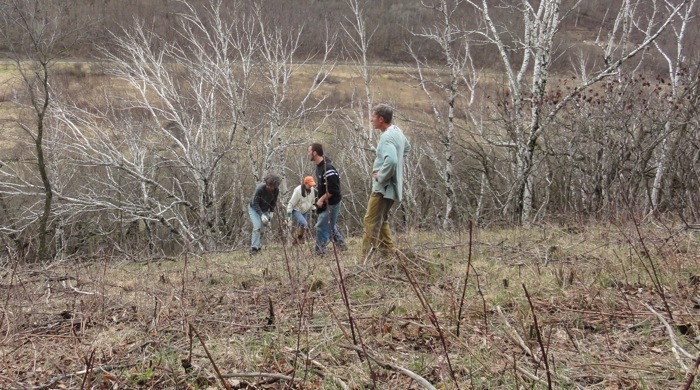 4/25/2011 Mike and I worked on moving the brush piles off the prairie, into the woods. 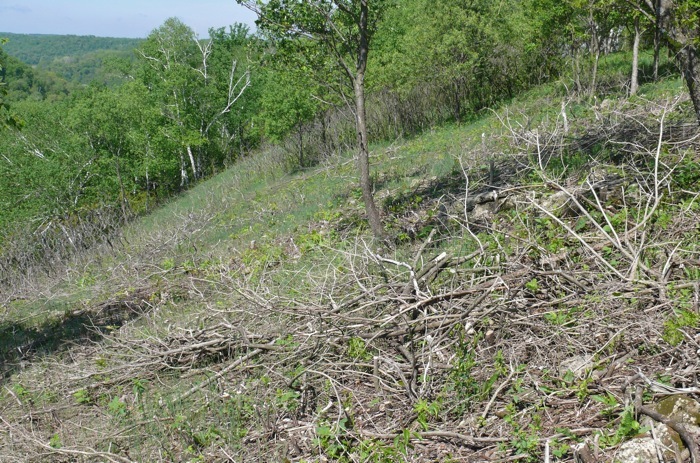 These were the piles we made with The Prairie Enthusiasts. 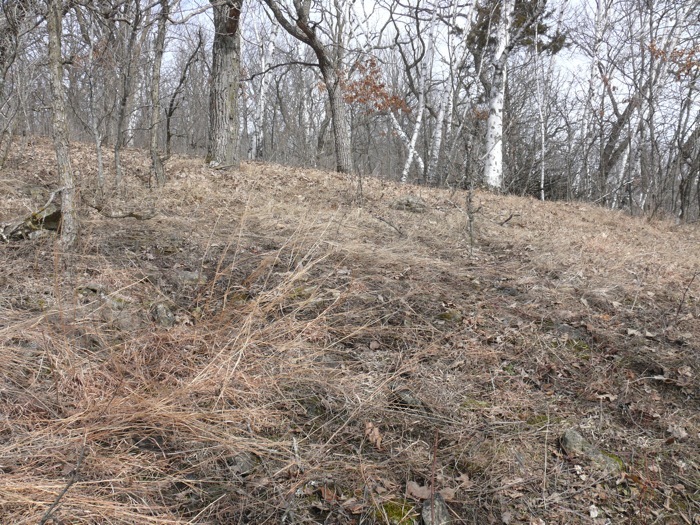 4/25/2011 These piles were from the fall Prairie Enthusiast project, and from some clearing that Mike and I did on our own. 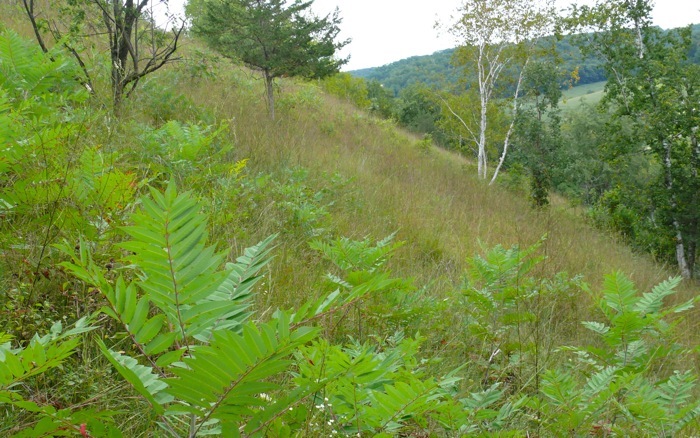 5/28/2011 – I worked on some of the steeper parts of the hillside – cutting and treating sumac. 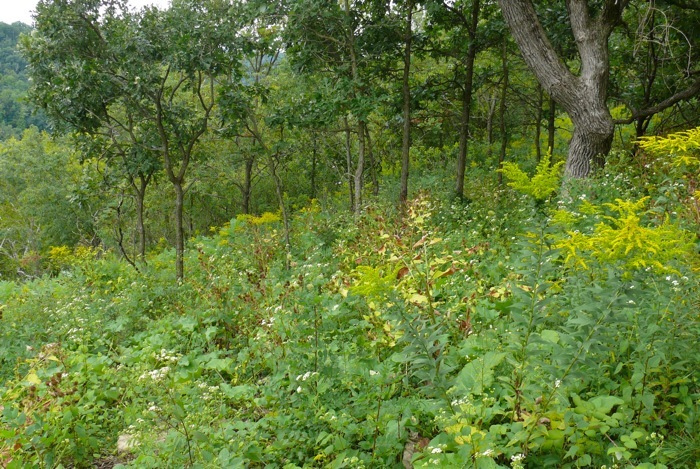 This area was a sumac thicket before I started. 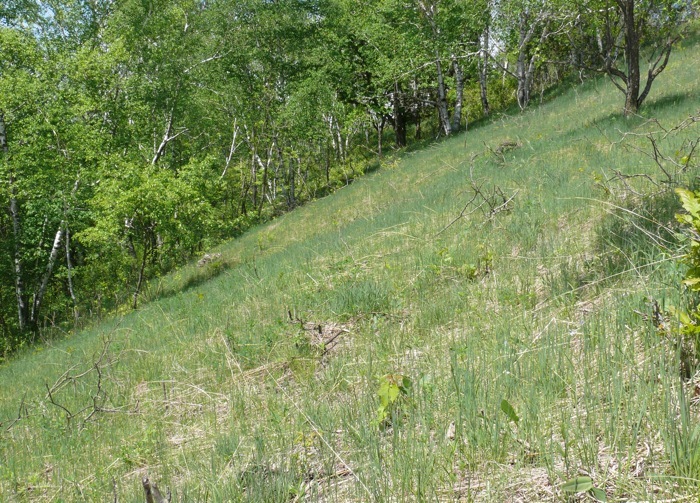 5/28/2011 – Sand Cress – a small dry prairie native – is coming up in some of the areas that we cleared. 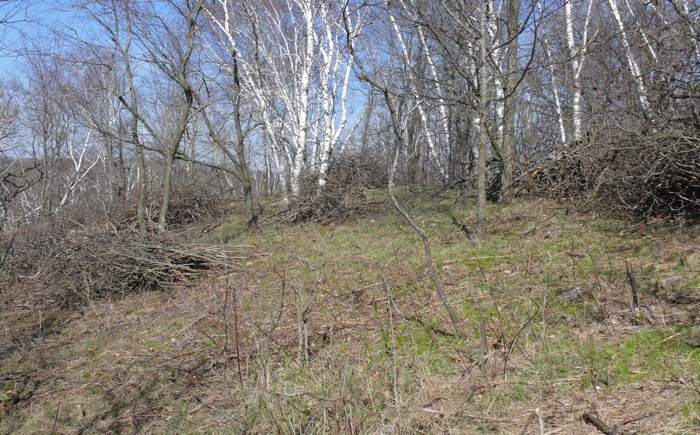 5/28/2011 – This is the area we cleared a month ago, with The Prairie Enthusiasts. 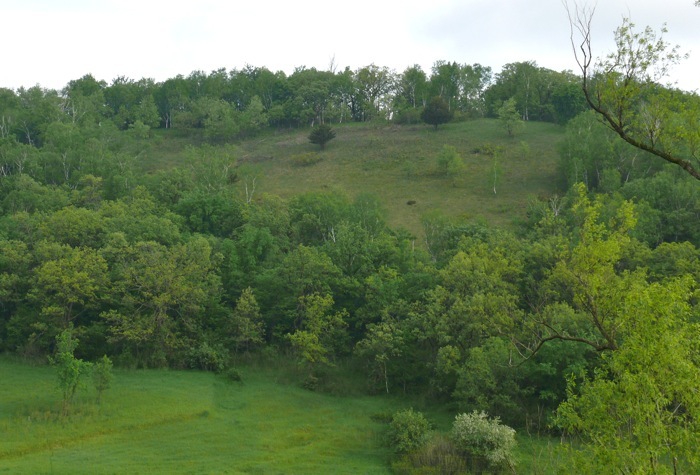 5/28/2011 – A slightly different view of the same area. 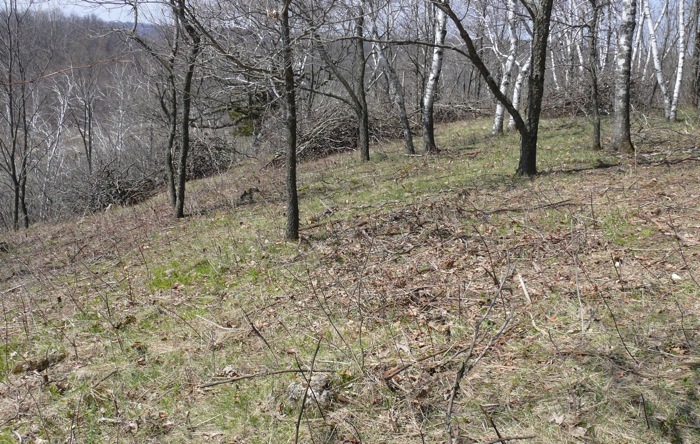 5/28/2011 This is an area Mike and I have been working on – clearing the dead trees, and cutting brush. 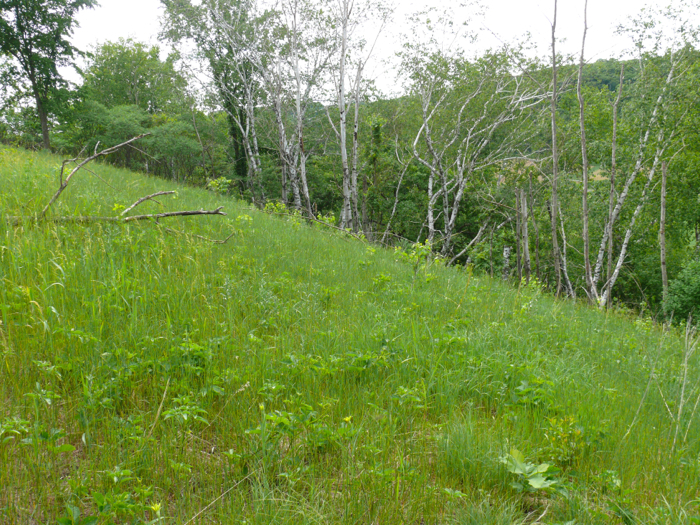 5/28/2011 – Spring view of an area that the Prairie Enthusiasts worked on last fall. 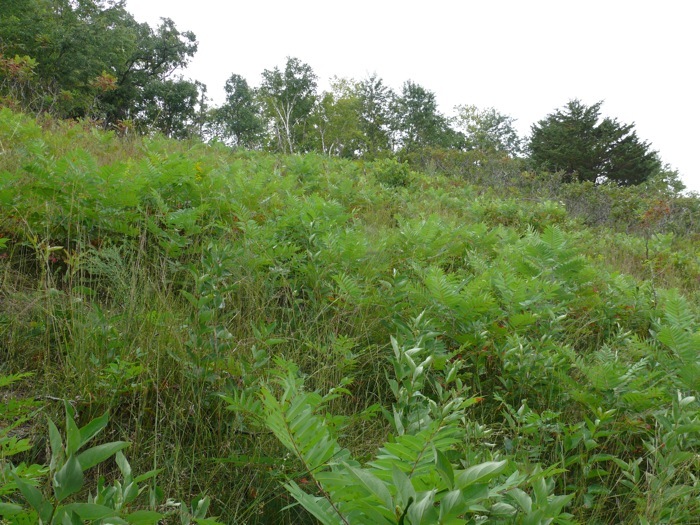 6/9/2011 This is the eastern end of Sumac Corner Prairie. 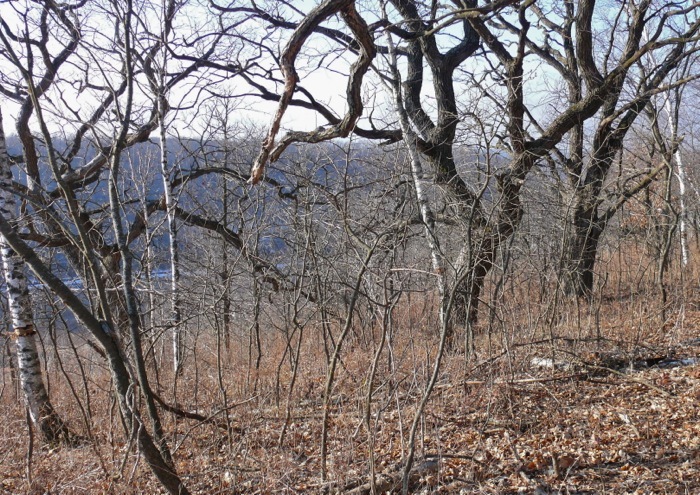 It still has a thick growth of birches and brush between it and the savanna below. 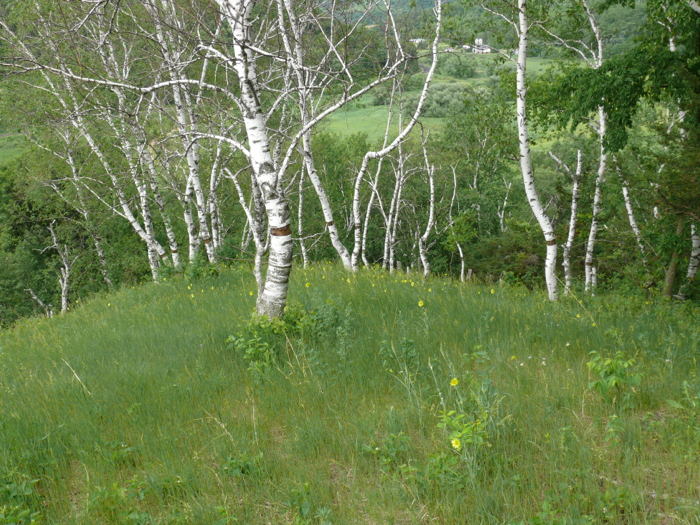 6/9/2011 The point of Sumac Corner Prairie – looking down through girdled birches. 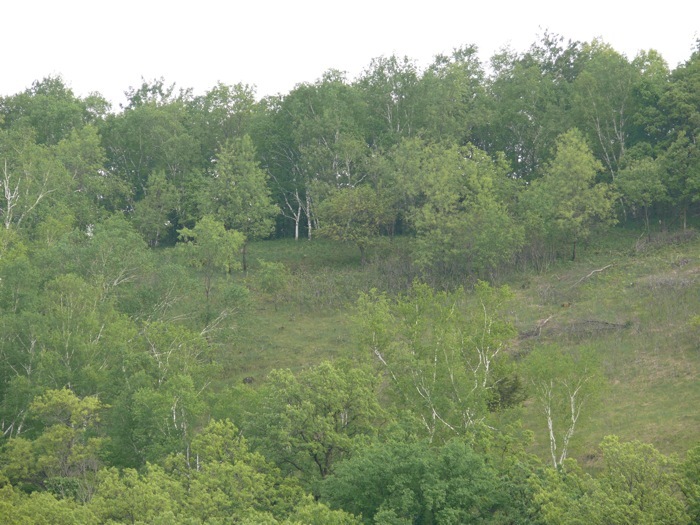 I haven’t been up on the prairie all summer – it was a hot summer and because the prairie is so steep and south-facing, it’s unbearably hot in mid-summer. 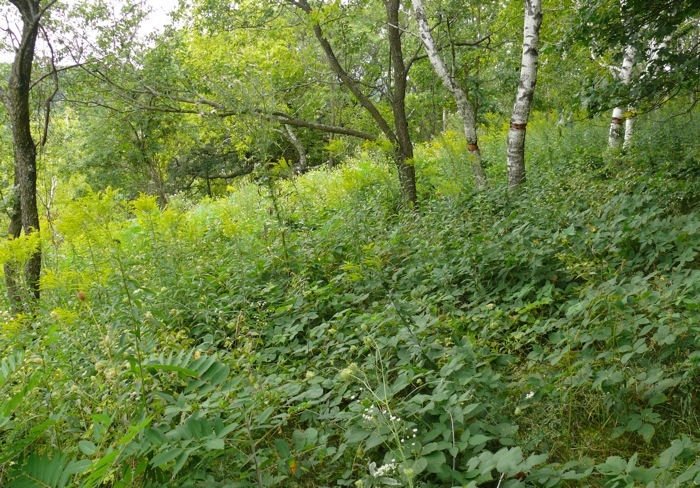 8/28/2011 – This is a slope I worked on last spring – clearing sumac. 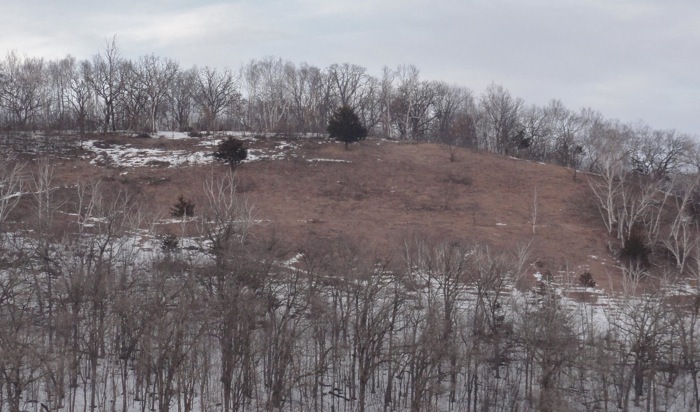 Parts of it are pretty clear – toward the center – but the edges have grown back. 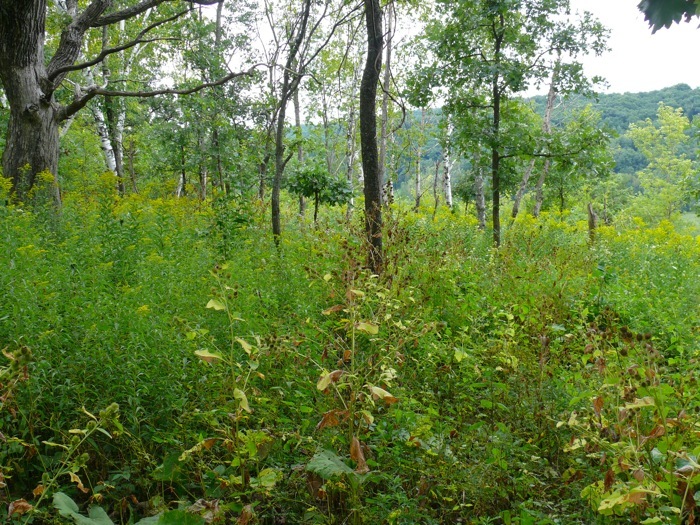 8/28/2011 – The area that the Prairie Enthusiasts did last fall. 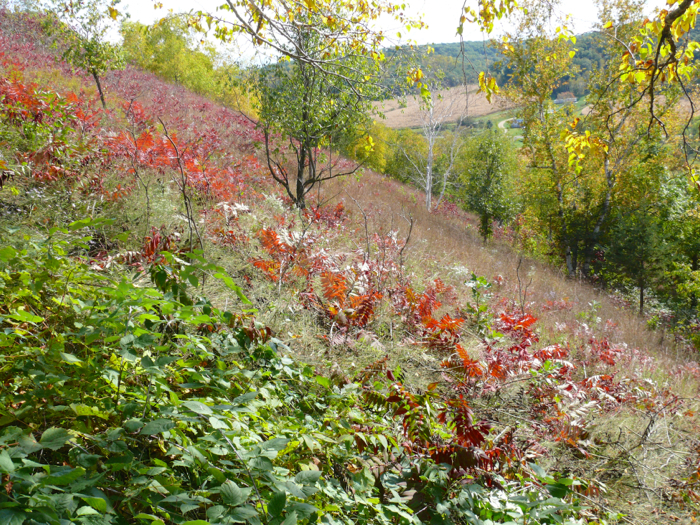 The nice thing about this sumac is that it’s small – so it’s easy to cut and treat. 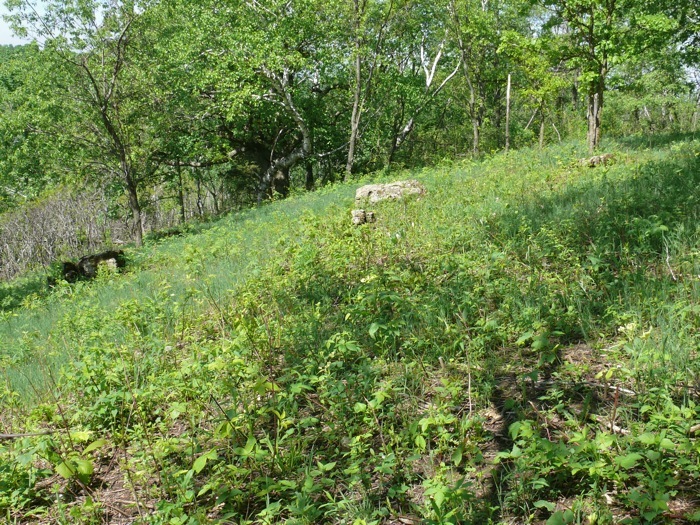 8/28/2011 – The center of the slope is looking better. 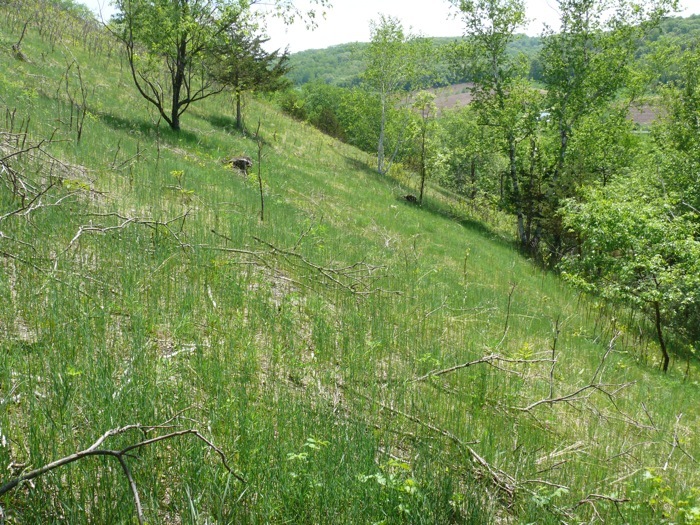 8/28/2011 The area that The Prairie Enthusiast crew worked on last spring. 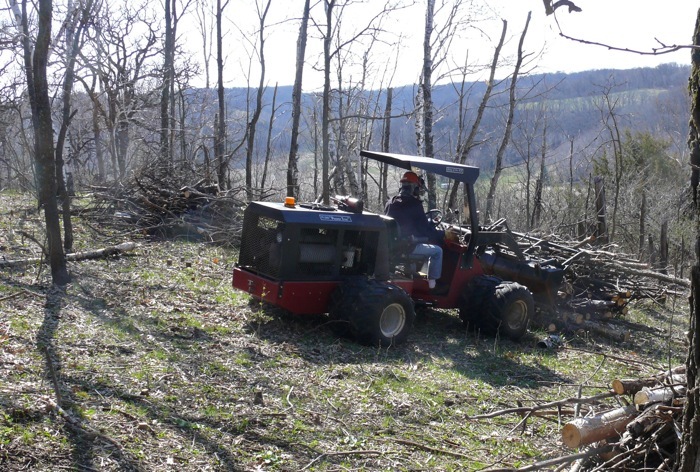 I wasn’t sure how well a spring project would work – there’s debate about how successful spring treatment of cut stumps is. 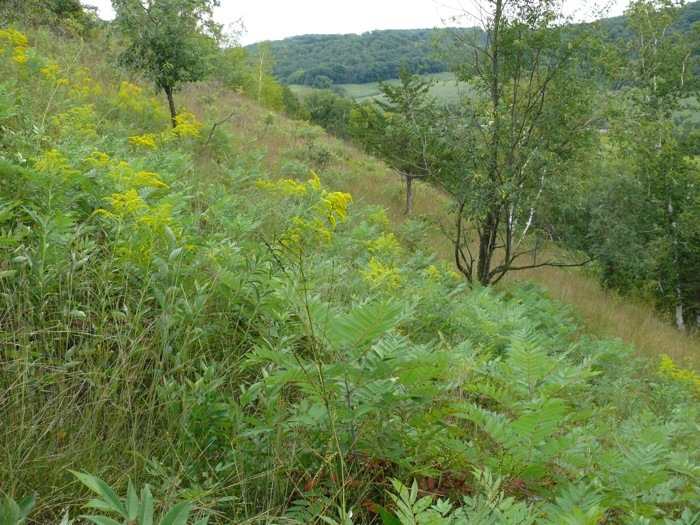 But this seems to have worked fine – the plants growing up are mostly raspberries, goldenrod, and White Snakeroot (Eupatorium rugosum). 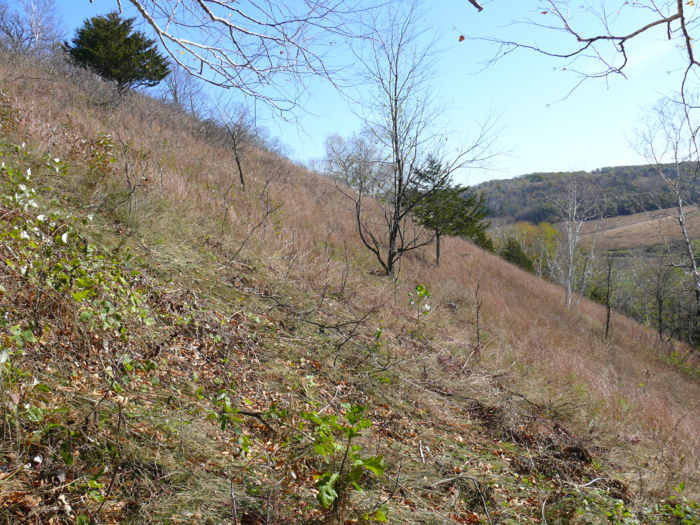 Hopefully, with some mowing, and more sunlight, these weedy natives will give way to savanna species. 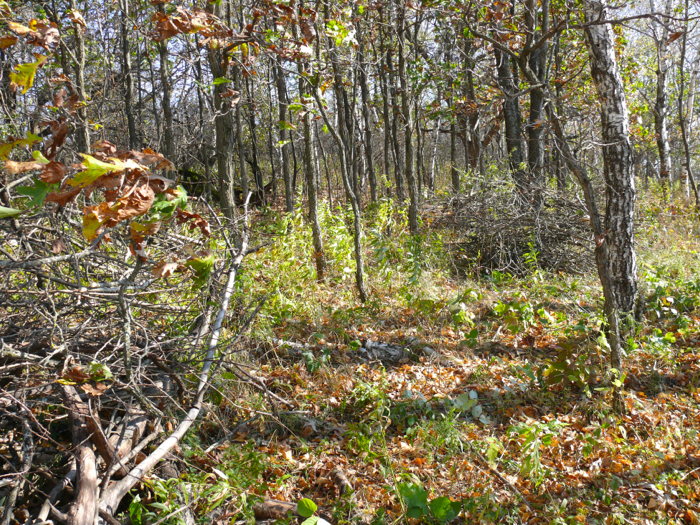 8/28/2011 More of the cleared area. There was quite a lot of burdock, which I cut and removed so it wouldn’t spread its seeds. 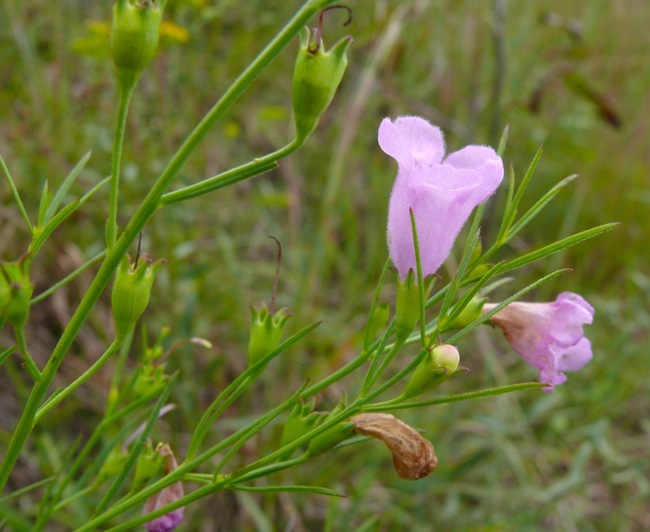 8/28/2011 – I refound a flower I haven’t seen here in many years. 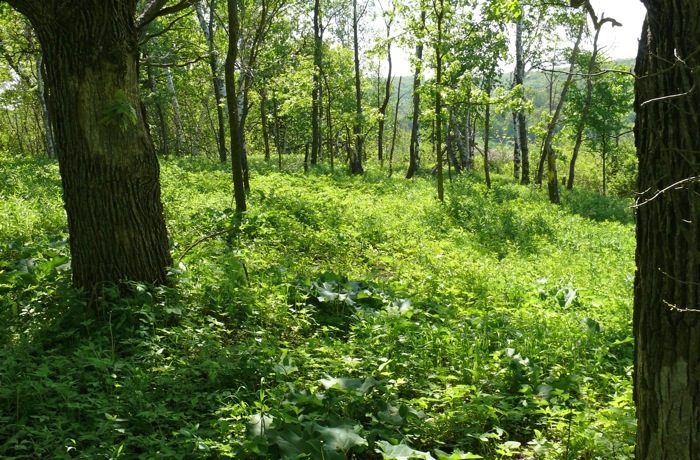 I first found it in 2000 – the first summer we were here. Then it disappeared, and today it reappeared. 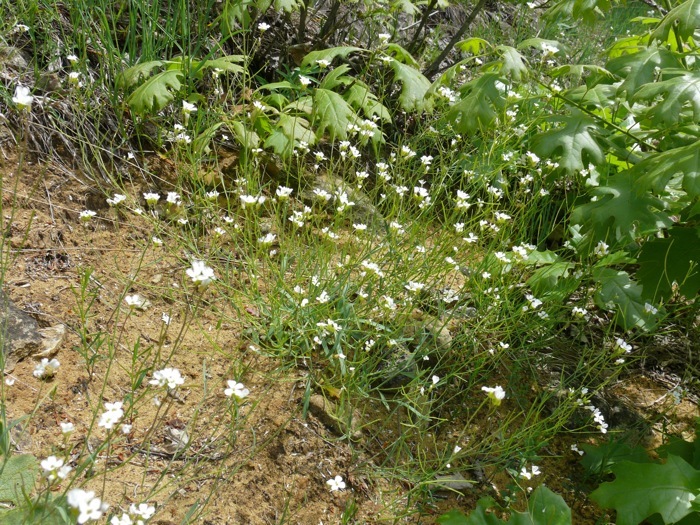 It’s an annual, and it grows in the steepest, hottest, sandiest parts of the prairie. 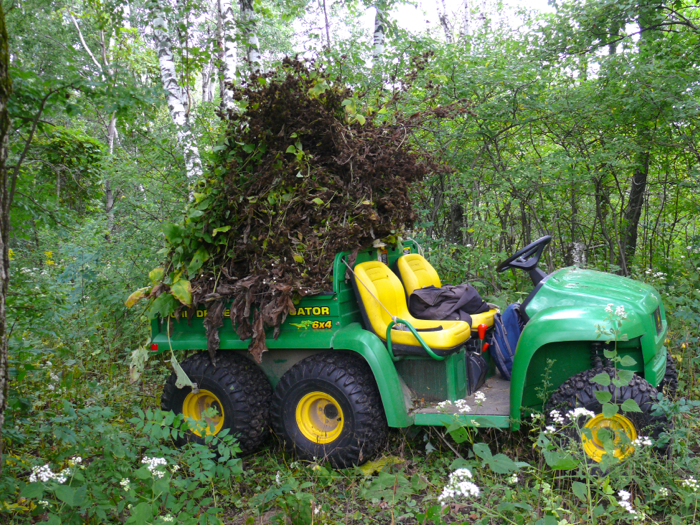 9/4/2011 I came up with the gator and collected all the burdock seeds. 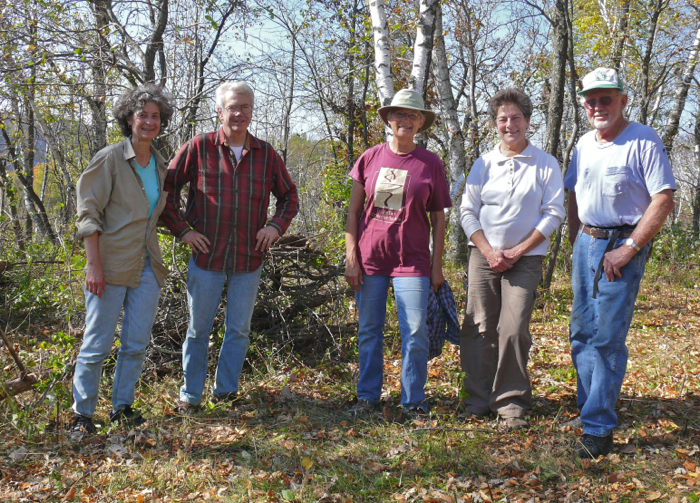 10/9/2011 Another group of Prairie Enthusiasts came back and helped cut more brush – Me, Mike, Kathy, Joanne, and Lee. 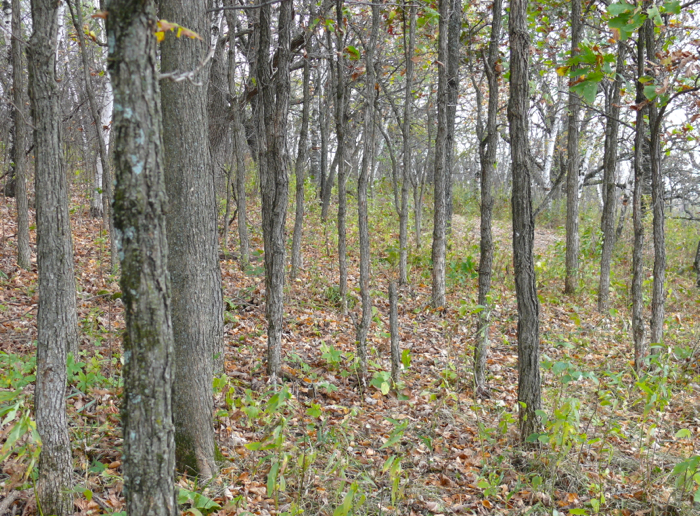 10/10/2011 This is the grove of small Burr Oaks that Kathy and Lee worked on. They cleared under the tree. 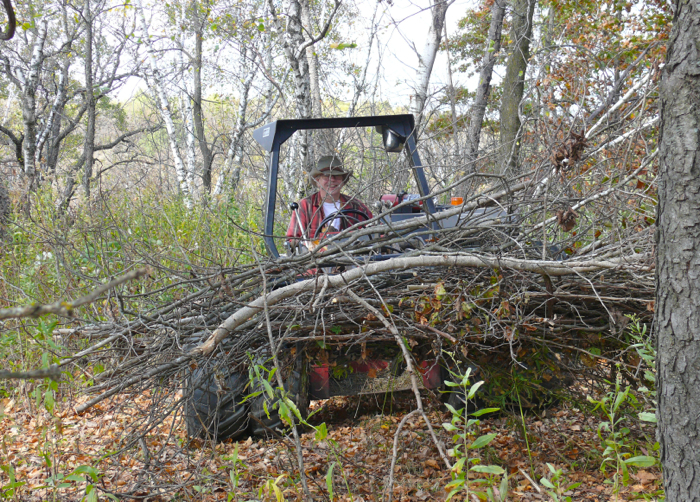 10/10/2011 Mike and Joanne and I cut and treated stumps and piled brush in the savanna just at the edge of Sumac Corner Prairie. 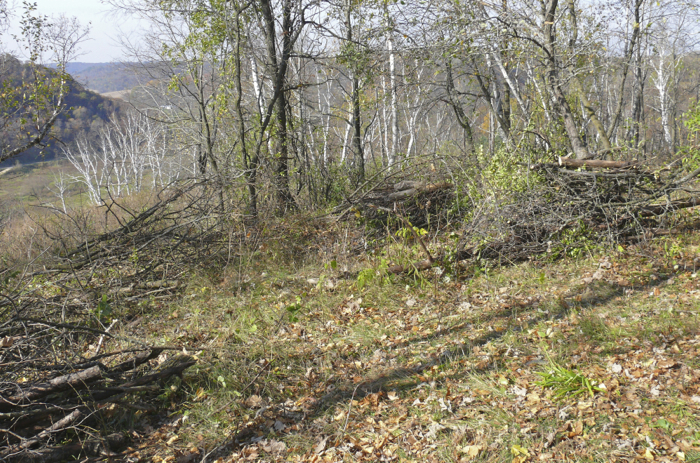 10/11/2010 After we removed the piles, we could see through to Sumac Corner Prairie. 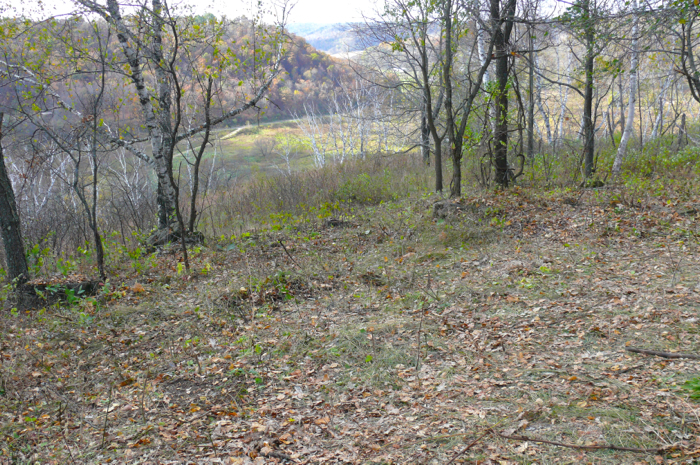 10/17/2011 I cut the rest of the sumac at the edge of the big prairie.